We deeply regret not getting a better picture of the snake we found coiled around the top rail of Della’s crib Thursday night. 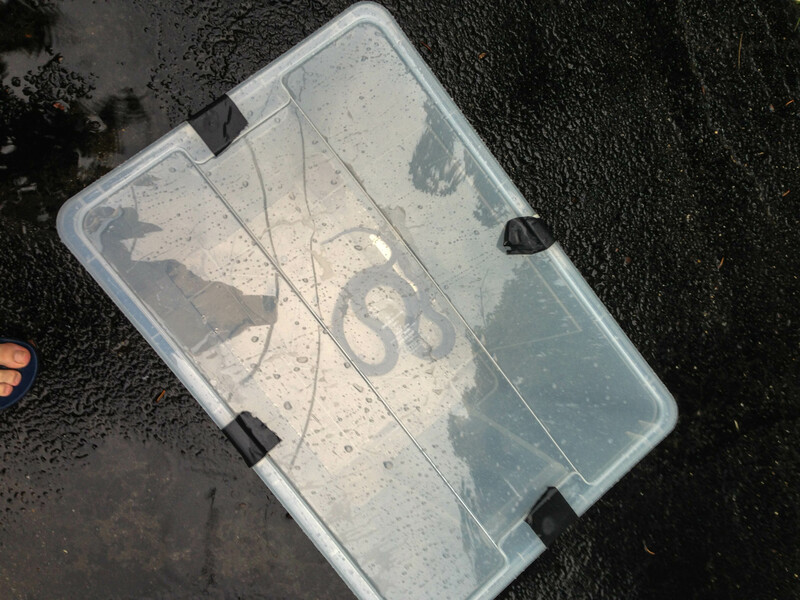 Here you can sort of see it trapped in this plastic container. It was just a normal evening. I was trying to wrestle Della into a diaper and pajamas after her bath. We were seated on the floor of her bedroom when I looked up and saw the drapey black snake body slither along the crib rail. I called for Steve and then darted with Della to the bathroom. Maybe I just imagined it, I said, and Steve hoped I was right. But there it was, and we didn’t know what to do. Decapitation with a shovel was our first idea. Finally we decided on catch-and-release with BBQ tongs and this plastic thing, which was full of winter clothes at the time. Tong sword in one hand, container lid shield the other, Steve bravely approached the serpent and tried to pinch it between his tongs, at which point the snake strategically dropped to the floor. In frustration, Steve shook the crib, and through some stroke up luck wound up pinning the snake’s head to the ground with one of the crib feet. The battle was won. No one wanting to be left behind at the snake house, we all three drove the snake to Huntley Meadows. Steve let him go while Della and I watched from the car. It was raining. A questionable source reminds us that 2013 is the year of the black snake and even claims: “a Snake in the house is a good omen because it means that your family will not starve.” Which is really good news. OH, MY GOODNESS! What a message to open the “MAC” to this morning! I am glad you are such an accomplished writer, Johanna. I felt like I was right there! BRAVO, Steve! You saved your family, and the snake,too. I have been busy since we returned from Sac. I am just getting into the computer, and I see there is some pretty special pictures and messages from Squinks.